We're not much into the whole lovey-dovey Valentine's Day celebration, but if we were… These pancakes would hiss, spit and sizzle their way from a hot pan to our plates in no time. Pancakes are fast becoming a favourite breakfast around our house. Byron can whip them up in a heart beat and I have been playing around with gluten free recipe variations for years. This recipe will produce lovely light, fluffy pancakes with soft, sweet red strawberries gently cooked into the top of each one. When we cook breakfast, we love to listen to Play that Funky Music by Wild Cherry for some serious groovin' whilst we sift, whisk, pour and sizzle. If you're familiar with the beat, you might be able to imagine two cheerful people in their pyjamas swinging their hips around the kitchen whilst a tiny chocolate coloured dog bounces between them, yapping happily. Sift together flour, baking powder, cinnamon and salt into a mixing bowl. Stir to mix thoroughly and form a well in the centre. In a separate bowl, add milk, eggs, maple syrup and vanilla extract. Whisk gently to combine, then slowly pour into the well of the dry ingredients, whisking to create a smooth batter. Add an extra splash of milk if too thick. Rinse and slice (5mm thick) strawberries, lengthways. Heat a griddle or large pan over medium heat, melt a dollop of butter in the pan. 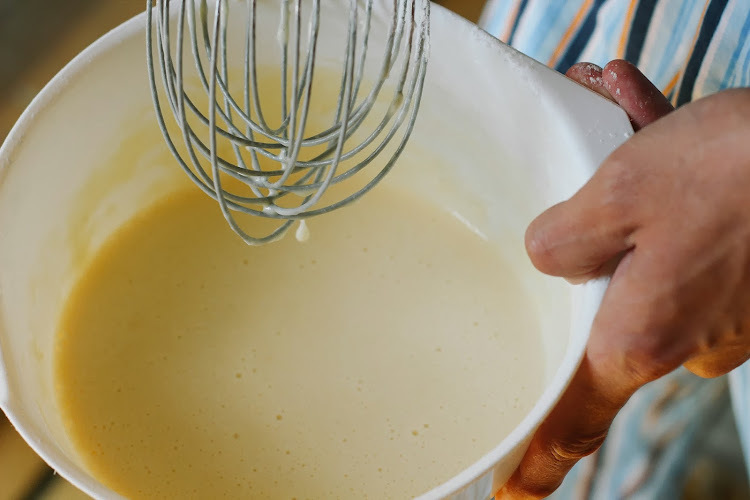 Pour batter into pan in small batches, approximately 1/4 cup of batter for each pancake. 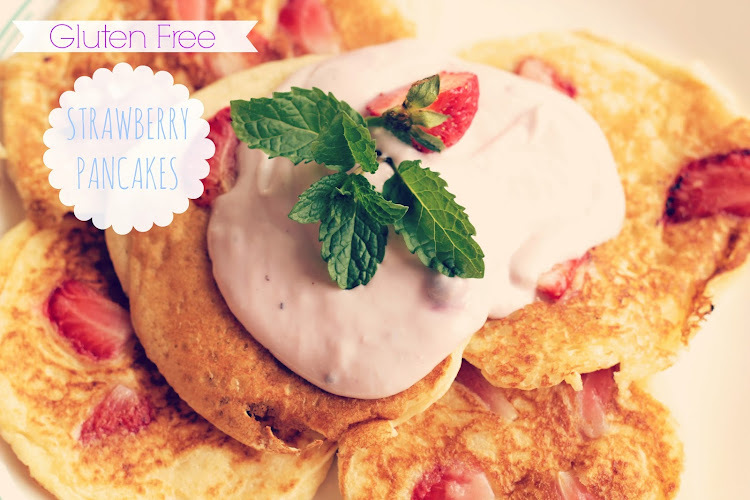 Press several slices of fresh strawberries into each pancake. When bubbles begin to form and burst, flip pancakes and cook until slightly golden on both sides. Serve immediately with your choice of topping: Maple syrup, strawberry yoghurt with fresh mint, cinnamon apples, fresh fruit and honey are some seriously funky sweet options. These pancakes can be frozen or refrigerated for later if there is a surplus. Lazy morning pancakes are the best so play that funky music and get your groove on! I am glad I found your blog! These pancakes look great! I love cooking too! If you would like to follow my blog this is the recipe apearlinoyster.blogspot.com. I would be happy to follow you too! Thank! HI Juliana, welcome. Thank you for your kind comment, I'll be popping over to your blog for another look this morning. and can't wait to try some of your dishes.